Scars, all my Orange County plastic surgery patients are concerned about scarring after surgery. Although the concern is understandable, having done hundreds of cosmetic and reconstructive procedures in orange county, I can confidently say the risk of undesirable scarring is low. In order to identify an undesirable scar, one must define what a desirable scar is. A desirable scar is very thin (1/3 to 1/2 of a millimeter wide, which is about 1/50 to 1/70 of an inch). It is not raised and does not itch (after the healing process is complete). The scar, however, will be lighter than the surrounding skin. Well-healed scars do not contain melanin, which is the pigment of skin cells. Therefore, in a darker skin individual, a desirable scar, although very thin, will be more noticeable than someone with pale skin. Undesirable scars can be categorized as wide and flat, hypertrophic, and keloid. Wide and flat scars, as the name implies, are wide (typically 0.5cm to 1.0cm or 1/5 to 1/3 of an inch) and flat. The skin where the scar lies is thinner than the surrounding skin. 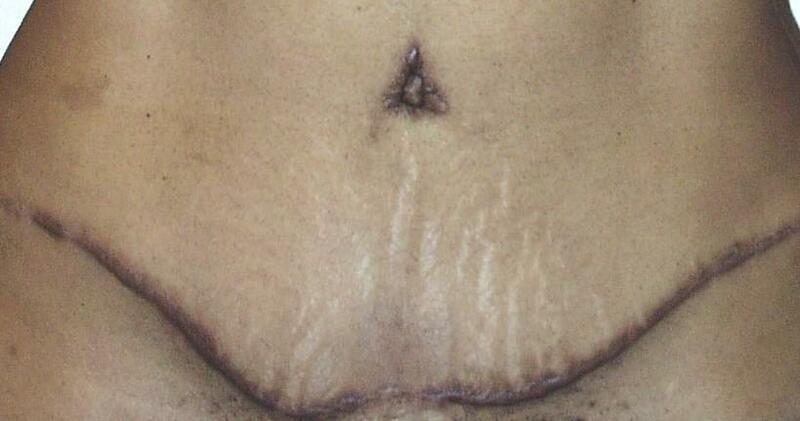 This type of scar is cosmetically very similar to a stretch mark. 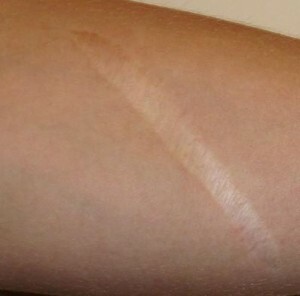 This type of scar occurs usually because of excess tension under the skin. As the incision is healing, the excess tension pulls the skin apart and thins the skin. The treatment is excision of the scar (in more than one stage if the scar is very wide) and closure with minimal tension. Hypertrophic scars are raised scars which are typically red and itchy. Typically these scars occur because of excess tension or movement (shoulder for example), infection during the healing process or genetics. The options for treating this type of scar is injection with a steroid, which causes thinning and flattening of the scar, excision alone, or excision with injection of steroid. The decision will be made at the time of consultation. There are patients, although rare, who genetically form hypertrophic scars. Keloids are scars which are raised and grow outside the boundary of the incision. This is different than a hypertrophic scar, which is also raised but stays within the boundary of the incision. The causes of keloids are the same as hypertrophic scars, and the treatment options are similar. In terms of keloids, however, injection of steroid is always recommended to minimize the risk of recurrence. Michael A. Jazayeri, M.D. is a board certified plastic surgeon with over 10 years of experience. His office is centrally located in Orange County, California. To schedule a complimentary consultation, please call 714-834-0101.